Function: Dry trimmer that removes small leaves from buds through a tumbling action while preserving trichomes. System trims, separates and pollinates. Designed for: Commercial growers. Specifications: Powder-coated steel frame, commercial motor with speed control, heavy-duty aluminum drums and axel, ½" and ¼" mesh nets, kiet net, clear funnel flow bag. Dimensions: 32" wide x 30" deep x 48" tall including drum. Retractible dust cover add 5" to the height of the trimmer. High Capacity: Trims 2-4 pounds per 5 minutes cycle. Trims 12-24 pounds per hour. Benefits: Very efficient, gentle on trichomes, easy to assemble, easy to change nets. Minimal maintenance. Produces clean trim. Maintenance: Nets are machine washable. Lubricate zippers as needed. 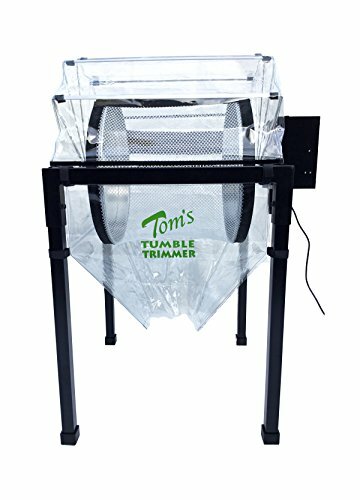 If you have any questions about this product by Tom's Tumbler, contact us by completing and submitting the form below. If you are looking for a specif part number, please include it with your message.